Adam Somlai-Fischer is an architect and creative designer with interests in new technologies. Adam is the program director of Kitchen Budapest media lab; he conducts design and architecture workshops across Europe and collaborates with other designers, artists and engineers to create interactive installations. Adam has been developing nonlinear zooming interfaces since 2001. Peter and Adam launched this beta application as part of Zui Labs, LTD. Prezi has been in private beta development for a year, and was released to the public on April 5, 2009. The application was known as 'ZuiPrezi' - 'Zui' as in zooming using interface, and 'Prezi' as in the Hungarian diminutive of presentation. On December 15, 2008 the team dropped the 'Zui' because people could not pronounce it correctly. Peter Arvai arrives to Zui Labs (October 2008) after having helped several start-ups launch on an international scale. He brings with him experience from Sweden, Japan, US and Hungary. He has recently published a book on mobile business development. Peter Halacsy and Adam Somlai-Fischer had been lecturing together extensively, and were frustrated with the limitations of presentation tools. Due to the limitations of slide presentations, Peter and Adam developed their own methods and scripted maps to hold these lectures. Over time (the last 4 years) their methods have matured and refined. Both men believed in "humanity's desire for creativity," and their dream was to create tools that "allow self-expression to take shape." Adam once stated that "a good tool needs to help you in: thinking, formulating and developing your message." With Prezi, the two men truly achieved this. We see presentations as a snapshot in time, and believe that each prezi lives both before and after a specific presentation. Prezi is a medium that should inspire creative thinking, discussions, and delivery of ideas from the moment of jotting down random thoughts to illustrating the story of a lifetime. We want Prezi to help every step of the way. While tastes vary, we strive to create beauty not just functionality. Because we think everyone should be free to communicate ideas with style, we provide our users with tools to express themselves beautifully. Small improvements with results that can be validated are the best way to move mountains. We don’t have all the answers, but if we listen carefully we will learn. Prezi is at its best when used to evoke curiosity between people. Connecting ideas using a shared surface is one of the best ways to do this. Even the most wacky questions and ideas are welcome--only bad days should keep us from dismissing them without consideration. Prezi, the product, and its employees cannot be separated from the rest of the world. We’re interested in the big picture, not just the things immediately close to us. For example, since the first year of our company we have renovated the homes of poor Romany families around Budapest during Christmas. The experience has helped us to better understand ourselves and our society. Fear of making mistakes is an enemy of innovation and creativity. We want to work in an environment where people dare to make AND admit mistakes. We try to avoid blaming each other, and we try to take a critical view of ourselves. We like to openly discuss everything---including our weaknesses. We are open to learn from our users’ experiences and encourage a dialog with them. We value that everyone at Prezi talks to users and listens to each others’ ideas. The value of Prezi is not just a sum of its features. We try to stay focused by avoiding unnecessary options that can be distracting or divert us from our path. At Prezi, we are diverse and are eager to learn about each other’s interests. We believe that there is inspiration to be found in most interests and activities. Introverted meditation and passionate discussion can also generate ideas which, in turn, create an exciting experience for our users. Be warned: sometimes we burst into karaoke songs, do swing classes, and invite the CEO’s mom to our parties. We don’t make promises we believe we can’t keep. Often it is easier to say ‘yes’ than ‘no’. Often it is equally easy to come up with excuses for why a promise wasn’t kept. We acknowledge the uncertainties of the world that we cannot control, but when we make a commitment we do our utmost to deliver on it. Prezi is an online, flash-based presentation creator. It shares similar functionality with other presentation programs, like Microsoft Power Point of Apple Keynote. While it is web-based, meaning an internet connection must exist to create presentations, presentations can be exported, allowing offline viewing and presenting. Now, you can even take your ideas with you by using Prezi on your iPad. Click here to watch a video on Prezi for the iPad. The purpose of Prezi is to replace less intriguing presentation tools with a more captivating and stunning presentation with incredible zooming capabilities. It is the presentation tool of tomorrow that can be utilized not only in the business world but also in the diverse world of education. Prezi uses a non-linear, large 2D, open perspective, with total freedom. Therefore, it requires a "small paradigm shift when viewing, and a medium paradigm shift when creating presentations." Prezi literally "captures" the audience by allowing a diverse presentation path throughout the application. Double click anywhere to write. The canvas is your workspace. You can double-click anywhere on this cancas to add a text box to jot down key ideas. You can drag the text box around to create more space. Zoom in to develop your ideas. Once you have added your ideas to the canvas as text, you can zoom in to these ideas to develop them and add more text. You can use the zoom buttons on the right side of the screen or scroll your mouse wheel to zoom in and out. Use the zebra for structure and size. You can arrange your ideas and create hierarchy through size. When you click on one of the text boxes, you'll see the striped transformation zebra, which lets you move, size and scale, and rotate objects. Add images from the Insert menu. When you're ready to add images, you can simply click Insert on the menu in the upper left, and click on the image you want to use. Once the image appears on the canvas, you can click on the image and use the zebra to move, size, or rotate it. After you've added and arranged your text and images, it's time to add the storyline or path. Use the zoom buttons or mouse wheel to zoom out, as seeing the "big picture" can help you determine the right path for the ideas in your prezi. Click on Path, and add your storyline by clicking on the parts in the order in which you want to show them. If you want to change the order of your path, you can Delete All and start again or drag the unassigned path ball (that appears between path numbers) to the object you want to show. To move into presentation mode, click on Show and step through your prezi with the arrow buttons or arrow keys. In Show, you can click to zoom in and out of your ideas at any point and press the arrows to get back to the path. Publish from Prezi.com with a click After you present, you can publish your prezi by clicking on it from prezi.com/my and checking the box marked Publish. On the Share tab, you can invite others to view or edit your prezi, and obtain an embed code to easily add the prezi to your blog. The Editing Menu is only visible in the editing mode, which is found on the top left of the screen. The user can click on the circles to activate them. For example, if the user would want to change the color or font that has been used he/she would click on the "Colors & Fonts" cirlce. By clicking on this cirlce, nine new smaller cirlces appear that tive the user the options of seven different colors and two different fonts. Simply begin by choosing a color or font to see what works best for your presentation. Prezi allows objects such as pictures, videos, and PDF files to be placed in a presentation. To upload a file, simply click the Place>>Media>> and File circles. Choose your desired file and upload it to Prezi. To edit your object, select Place, and the Transformation Zebra will appear. The Zebra allows you to move, scale, and rotate objects. The escape key will take the user back to present mode. In order to direct your presentation path: first, select the Path mode. This option can be found under the Place circle. The user can click on the objects or numbers in the order they want them to appear. The chosen path can be tried out in the presentation mode. New objects can be included in your path by selecting the "red dots" and placing them on the object desired to come next. Objects can occur multiple times in a path. Import assets (like screenshots) at the resolution you plan to present at, otherwise your imported assets will look awful. I recommend you set up two monitors when you’re building your presentation. One monitor can be set at 1024 × 768 and the other can be used to find assets, organize your imported files, or to explore ideas online. Here’s a short video on setting the correct screen resolution. While we’re talking about the correct presentation resolution, it’s important to remember that Prezi is designed to help you easily present at 1024 × 768. Anytime you’re creating a cornered-frame, hold down the shift key while you draw it. This will ensure that you’re creating a frame that will fill a 1024 × 768 (or 4:3) presentation screen. Working efficiently in Prezi, like many software suites, completely hinges on using the keyboard shortcuts. Using these keys allows you to keep your mouse working close to the assets you’re organizing while you efficiently change modes. When I set out to create a presentation, I think in 10-minute frames. Meaning that for a 60-minute presentation, I start by drawing six large circles on the canvas. Then I begin filling in each frame with about 10 minutes of material to build my six main points. Thinking in frames, instead of slides, is one of the hardest things to remember when working in Prezi, but it is the most liberating. There’s a tendency in Prezi to zoom all over the place. While this might seem fun, I don’t believe it adds value to the presentation and it disorients the audience. When you’re building moves think like a film editor. Create an “establishing shot” when you’re about to zoom into something. If you’re going to spin to something, make sure the viewer has a reference point to spin from. This may be one of the hardest things to adjust to in Prezi, but work to help your audience understand where you are moving from and where you are moving to each and every time. One of the key secrets to building Prezi moves that help keep the audience oriented (and avoid dizziness) is to overlap elements – even ever-so-slightly. This ensures that the movement has a beginning and ending reference which helps orient your audience to the landscape you’re building. PowerPoint, and other more traditional presentation tools, have become crutches for many presenters. I try to remember everything I’m going to present, but we all know this is impossible unless you have days to rehearse. So to keep on my feet without a crutch, I include ‘presenter hints’ – very small text elements tucked into any areas where I need a ‘prompt’ or a reminder. For example, dates, numbers, or data sources are hard for me to remember, so I make sure to add these as small text elements in my frame. I just don’t make them the center of attention. As you’re building your Prezi, be consistent with the way you use frames and text styles. For example, if you use Circle Frames to organize big ideas, stick with that. If you use ‘blue text’ to headline your big ideas, stick with that. Although the audience may not consciously recognize this consistent use of elements, I believe it does help them understand the organizational structure of your presentation. I create and clear my paths sometimes a hundred times before I put the final presentation path in. This helps me organize and re-organize my presentation without worrying about perfecting the pathing. Wait until you’re all done adding items and organizing your presentation before you finalize your path. It will make pathing much less painful. II. How Does Prezi Relate to Other Applications? Prezi is most commonly compared to the PowerPoint application. The purpose of Prezi is somewhat similar to the PowerPoint: to provide a visual presentation. Just like any other application, Prezi could be difficult to use at first; however, with time, it is easy to use and is more visually stunning than more common presentation tools such as Microsoft's PowerPoint. Prezi was created because of the limitations of visual presentations. Prezi has just about every tool, such as PowerPoint would have. PowerPoint is consistent with the slides, but Prezi is full of surprises and offers a diverse new look in accordance with each idea, within the presentation. With Prezi, users can visually lay out their ideas, see their whole presentation as a map, and zoom in to certain areas on which he/she wishes to focus. It is important to know that with Prezi there is no software installed on your computer. It is required to have an internet connection to design presentations. After you are done designing your presentation, you can export it to a file format that allows it to be viewed on computers that are not connected to the internet. Prezi can be used in many situations. Prezi is suited perfectly for a sales pitch, a business presentation, teaching purposes, speeches, conference presentations, and "how to" lessons. Prezi should replace other presentation tools because it is much more visually intriguing. In "how to" lessons, Prezi can implement text directions, as well as step-by-step videos that can be imbedded. Business presentations can implement text statistics, along with pictures, graphs, or even small animations. Math students, teachers and scientists, this is for you! There is a nice workaround introducing how to use the popular LaTex markup language for math equations in Prezi. Tips and tricks from a prezi author available in our community forum. More after the jump! It's not always easy to embed a prezi to a blog even though every prezi has an embed code that you can copy/paste easily just as you instert YouTube videos to your posts and social sites. II.2 Who Can Use It? Prezi is designed to attract those in the educational or business world that are looking to advance current presentational capabilities. However, the videos and instructions available in the "learn" section of prezi.com make this application very user-friendly to anyone willing to take the time and learn! Users can range from the student preparing a presentation about plate techtonics to a board member of a company displaying the yearly gross income. With the appropriate amount of time allocated to learn the software and the intricacies of how to use it, a wide range of people will be able to use Prezi to its full potential. "First, thank you all for your kind support to help us launch Prezi. Your stories and dedication has helped us fix many bugs. On April 5, Prezi will go fully public. You won't need to wait and apply for beta, you can use Prezi right away. If you have enjoyed the past months with us, please help us and spread the word next Monday. We have attached a short release text for you to forward." On April the 5th if you don't already have a Pro license, your account will change. You will go into "Trial" mode which means that you can do 3 more Prezis before you will have to choose between a free or two paid licenses. All your existing presentations will stay intact. " Prezi.com will go through maintenance, and will not be available for about two hours." We want to celebrate the release together with You! You are invited on April 9 to our release party. We can help you find a hotel if you need advice. We've been working hard day and night, so you can count on a blast!" We'll have the party on April 9 at Tripla (www.triplacafe.hu Kiralyi Pal st. 6, Budapest) our local bar where we hang out every week. - We are inviting a lot of you, and not everyone will fit in the place, so first come first serve basis. The first 150 gets a spot. - Most major EU airlines are flying to Budapest: KLM, Air France, Austrian, SAS, Malev.hu, German wings, Lufthansa, Easy jet, and many more. As illustrated, Adam and Peter really hope to see this application take off and are willing to work with anyone interested in joining them. "Technologies known collectively as Web 2.0 have spread widely among consumers over the past five years. Social-networking Web sites, such as Facebook and MySpace, now attract more than 100 million visitors a month. As the popularity of Web 2.0 is growing, the business world needs to grow as well due to the intense consumer engagement and creativity surrounding these technologies. These new tools include, but are by no means limited to, blogs, social networking applications, social networking tools, and wikis. Young people seem to be particularly attracted to many Web 2.0 developments, often for the social aspects of easy communication, coordination and online expression of personal identities. Offer new opportunities for learners to take more control of their learning and access their own customized information, resources, tools and services. Encourage a wider range of expressive capability. Facilitate more collaborative ways of working, community creation, dialogue and knowledge sharing. Furnish a setting for learner achievements to attract an authentic audience (Becta, 2008). Prezi is a web 2.0 technical platform that businesses can use to build the differing types of technologies into everyday business. Prezi allows anyone who can sketch an idea on a napkin to create and perform stunning non-linear presentations with relations, zooming into details, and adjusting to the time left without the need to skip slides. Using Prezi in an educational context will allow educators to create and map ideas, images, videos, then show overview, zoom to details, amaze, convince, take the day! (Prezi, 2009)." The advantage of using Prezi as a learning tool for a subject like project management, is that businesses are constantly working on projects. Having their workers use this learning process through Prezi, will allow employees to formulate project plans for the business as well as being educated and trained at the same time. Additionally business can then present this information to clients through Prezi, either face-to-face or across different continents, using the great presentation features of Prezi. Students will be creating a Prezi presentation after a classroom discussion. Objectives: After choosing one of the class' "Five Finger Stories," students will be able to create a Prezi presentation incorporating all 5 steps of their chosen story. Students will be creating a Prezi presentation based on the solar system. Objectives: Given a description of the solar system students should be able to label the planets in order with 100% accuracy. Materials and time needed: Description of the solar system in writing (book), Computers with Prezi access, about 30 minutes for creating planets. Students will create a storybook in Prezi based on the life cycles of plants. Objectives: Given materials they student will be able to photograph the stages of a plant, and create a photo story with 100% accuracy. Students will create a presentation about the water cycle using Prezi. Target Audience: 3rd grade Students will create a presentation in Prezi about the water cycle. Standards: Principles of Earth and Space Science (ES.1.21)--Identify the various processes that are involved with the water cycle. Teachers will present a Prezi slideshow and the students will complete a worksheet. Target Audience: 2nd grade students will be presented with a presentation in Prezi about penguins. Objectives: Through the use of the Prezi slideshow presentation, students will compare and contrast the ways that penguins are different to flying birds. Students will be creating a Prezi presentation based on story that they have created. Standards: 1: Facilitate and Inspire Student Learning and Creativity. Standard 2: Design and Develop Digital Age Learning Experience. Objectives: Given the materials of both a computer and the Prezi application, students will create their own stories (fiction or non-fiction), and then bring their stories to life using Prezi, to the best of their ability by the due date. Students will be creating a presentation on Prezi about their favorite basketball player. Objectives: After completing this lesson, fifth-grade students will be familiar with creating presentations on the online application, Prezi. Students will be creating a Prezi presentation based on a theme from To Kill a Mockingbird. Objectives: Given the Prezi application, students will create a presentation about a theme from To Kill A Mockingbird with 75% accuracy according to the rubric. Also, students will take a unit test and pass it with at least 70% accuracy. Students will be creating a Prezi presentation based on an event from World War II. Objectives: After completing a unit covering World War II, students will be able to create a Prezi presentation with 85% accuracy according to the rubric. Students will be learning about the color wheel based on a Prezi presentation created by the teacher. Objectives: By using Prezi, students will create a color wheel that introduces the basic colors of the color spectrum with 100% accuracy. Students will learn the parts of a cell and each part's specific function within the cell. Standards: This project will satisfy Indiana's Academic Standards B.1.1-B.1.3 for high school level Biology I. Objectives: After basic review of a cell and its parts, groups of students will be assigned a specific type of cell (e.g. plant, nerve, muscle) to research. Using the Prezi presentation software, students must research and develop a presentation outlining the parts of the cell and their function. Their presentation will then be presented to the class and graded on correctness. Objective: After completing a lesson and creating a PowerPoint presentation, students will then complete a lesson and create a Prezi Presentation. Students will be able to create outstanding Prezi presentations and be able to compare and contrast the pros and cons of each presentation tool. Students will be able to distinguish between the different types of sharks by creating a PowerPoint presentation, and observing other classmate's presentations. Standards: The Living Environment. People have long been curious about living things - how many different species there are, what they are like, how they relate to each other, and how they behave. *Objective: *Performance, Conditions, and Criteria. Students will be able to distinguish between Hammerhead, Bull, and Great White Sharks through making an online Prezi presentation with a 100% accuracy. Students will create a timeline on Prezi based off a novel. Objectives: After reading a novel set in the 1940's, students will be able to create a timeline in Prezi that demonstrates the transformation in communication techniques with 80% accuracy according to the rubric. Students will use Prezi to provide steps in preparing food. Objectives: Given Prezi presentations, students will use them as a learning tool to cook several types of food, all with 100% accuracy. Students will use Prezi to make a presentation of their art work. Topic: Elements of Art: color, line, shape, value and texture. Objectives: Given a studio problem, students will be able to use the 5 elements to fix the design with 100% accuracy. Students will create a Prezi presentation on their chosen topic pertaining to Biology. Objectives: Students will be able to create a Prezi slideshow presentation on their chosen topic about Biology and then present it with confidence to their peers. CEO's will use Prezi to present information to the company. Objectives: Using the Prezi application, co-workers will present their solution of a company problem, executing professionalism at all times. Businesses will use Prezi to keep children entertained at workplaces. Objectives: With the use of Prezi in public places/waiting rooms, children will be able to play interactive games and stay attentive. Coaches will use Prezi to show plays and films to the players. Objectives: With a digital playbook created on Prezi, sports teams will be able to examine film, plays, snapshots, and statistics. "We presented on Visual Literacy and Creating Film Festivals for students. For this presentation, I used Prezi- which is sort of a cross between a mind-mapping program (like Inspiration) and any given presentation software (like Keynote or Powerpoint). Its a great tool if you have trouble organizing your thoughts in a linear fashion (like yours truly). You can put all your ideas into the presentation in whatever order they come to you- and then create a path to help transform your cluttered ideas into a linear arrangement. If you're looking to build your own film festival, or just want to see another prezi in action (they can be addicting), take a look at our presentation. Prezi is one of my new favorite web tools. Its easy, its slick, and it combines organization and presentation into one easy application." David Gran, which is the man that said the previous statement about Prezi, and did the presentation in Beijing also made known that felt like Prezi bridged the cultural gap between him and audience, with ease. This is a very important element of any internationally adapted presentation tool. Keyboard shortcuts are limited when going fullscreen from a browser. Download your Prezi to to use all shortcuts in fullscreen mode. When uploading images, it could cause some trouble if the JPEG is a progressive type (the one that comes in refining scans), is in CMYK color mode, or is a JPEG2000 type. Any other non-standard extensions can lead to malfunction, e.g. some photo management softwares write non-standard EXIF or IPTC tags in the image file. A Prezi with media bigger than 50 MB cannot be uploaded to Prezi.com from the Desktop Editor. You also cannot upload such media in the online editor. SWF files created by Adobe Illustrator can only be added to the end of the path. If you experience jerky motion while transitioning from one state to the next viewing your Prezi, it may be caused by creating all your content at too small zoom level. The solution is to select everything in your Prezi (zoom out with Ctrl+SPACEBAR to show everything, and SHIFT drag a selection rectangle around every element in your Prezi), than scale it up using the transformation zebra. Please note, that scaling up from small zoom levels may slightly rearrange items in your Prezi due to rounding errors in Flash. It is currently not possible to load a PDF in Prezi Desktop, the offline editor. Uploading from Prezi Desktop 3 to Prezi.com makes a new copy of your Prezi online. Creating a Prezi in the Prezi Desktop Editor with images that are not supported in the online editor may be possible. If you upload such a Prezi from Prezi Desktop, these images will not be visible online (a download bubble may show up instead). How to use Prezi and the different applications in Prezi. Learn how to use Prezi in four minutes. I'm hoping that I am leaving this comment in the right place and everyone is able to see it! I'm really encouraged with the members we have in our group and I am excited to be working with all of you, both in edci 270 and our international members over in Australia. I would really appreciate some feedback from everyone, it doesn't have to be anything insightful right now =) Just a "hey, I see this comment" works for me. We will get into discussing everything more heavily after we meet in class or hopfully over skype with our Australian members. Hope to see everyone soon! Hi Mackenzie, I have worked out how to actually record some conversation now, so things are starting to open up for me. if everyone could confirm on this discussion what email address you prefer to be reached at that would help, in case we need to communicate through email. -Also, please be thinking about what area you will be wanting to work with for this project. We will all have primary and secondary roles, so think about what you would like to kind of take charge of and also what you could asist with. Biggest thing to think about is diversity and originality. With 11 different members I definitely think we can all bring in different strengths. We need researchers, visual artists (to design our wiki page), writers, editors, presentors, analytical thinkers and various others. To help us begin, it would also be beneficial if everyone could familiarize yourself with Prezi and what the application actually does. Ok, sorry for all the rambling, but hopefully this helps and makes sense. I could do a primary role of a presentor, editor, researcher, whatever is needed. We could see in lab what strengths everyone has for the roles. Hi, my name is Subin Ivy Kwon, but you guys can call me Ivy. You guys can contact me through kwonsi@purdue.edu. Hi everyone! My name is Lauren Stroman. The email I check frequently is lastroma@purdue.edu. I'm looking forward to getting this project started! when it comes to the different roles, as of now i can do pretty much anything, call me the utility guy i'm good at picking up the slack. Be checking about your lesson plan. Hello, my email is jchalfan@purdue.edu. I'm looking forward to figuring out Prezi. Hi all, my email is nevson1@bigpond,com.au. I am keen to get the ball rolling of this wiki, prezi, flexible style of learning communicating. I could research, present, and think analytically to start with. throwing around ideas with relation to this project. Will we be presenting a visual application on how to use prezi? similar to the youtube 'everyone loves icecream' presentation (I think that is the title). I will continue to do research and post the info. Mackenzie, let me know if this is what you want me to do or if there is something else I should be concentrating on. notes/info.. some of you may have already read this through your own research. Hungarian company, inception - 4 yrs ago, 2005? two computer scientists - Peter Arvai (CEO of Zui Labs?) & Adam Somlai-Fischer (lead developer) they were frustrated with the limitations of presentation tools. Adams comment, 'a good tool needs to help you in: thinking, formualting & developing your message'. creative showcase of idea maps, combining text, images, video. Meaningful plan providing the big picture which can be broken into clusters/topics, titles are scaled up so you pin point from a distance, follow flexible pathways and zoom to read text, view images. quick facts from the web site - create stunning/striking presentation; easy to create/edit & master; shows details & overview; not bound to an order; supports rich media; cross platform (adobe flex); conveys a meaning and responds to a live audience without skipping slides. use/application - 1. edit, add from files & online, create interest through images/videos. 2. list information. 3. timelines - segments showing detail. 4. graphs. 5. start a mudmap - link ideas/shapes/highlights/pathways - giving structure & shape. 6. Framing & rotating, resizing. 7. scaling. 8. create paths & edit paths - new objects in an existing path can be picked up and added multiple times within the presentation. interface allows the placement of thoughts, like an artist creating a collage. can be used with windows & mac, created anywhere and can be shared, uploaded, downloaded. navigated by mouse, keyboard and touchscreen. no problem. It's listed as a "Children" page at the top of our main page. You should see that section and the research page is under that. Let me know if you find it! ahhh I'm still having problems finding it...... what main page are you talking about? After you login, this main page that we are commenting on. Go to the top and you will see the headings I have posted, then scroll down and in between where we are the headings and where we are commenting you will see the heading "Children." Under that the Prezi Research page is listed. Click on it and then once you are in it, click on 'edit' up on the top right and add your 3 postings. Hopefully this helps, but let me know! Some groups/labs were told to Skype with their IP's before Wednesday for extra credit. What is our plan with Skype? Did Cindy require us to have this done by tomorrow as well for 4 extra credit points? I was just making sure I wasn't missing out on something! the deadline is flexible. No worries. We need to work it out soon, but we can still get our points! Thanks Mackenzie, I have been looking for info on international application, found a little, but will keep looking. It looks great! Keep up the good work! I havent heard anything from Mackenzie whether or not Neville can Skype today. Hi Mackenzie, I have read the info regarding history & development and there is a mistake with the info (& spelling mistakes). Co-founders of zuilabs are Peter Halacsy (not Peter Arvai) & Adam Somlai-Fischer. I did not want to edit your work until we discussed this further. I have added my info below, as the research page link has gone...?. http://www.tradevibes.com/company/profile/zui-labs Zui Labs started in a very organic way; Adam and Peter - a world leading designer and a pretty good computer scientist - had been lecturing extensively. Due to the limitations of slide presentations they developed their own methods and scripted maps, to hold these lectures. Over time (last 4 years) their methods matured, got refined. CTO, Co-Founder - Peter Halacsy has been assistant professor at the new media department of Budapest University of Technology after having been the lead developer of Origo.hu, Hungary's largest Internet Company. Peter co-founded Kitchen Budapest with Adam. 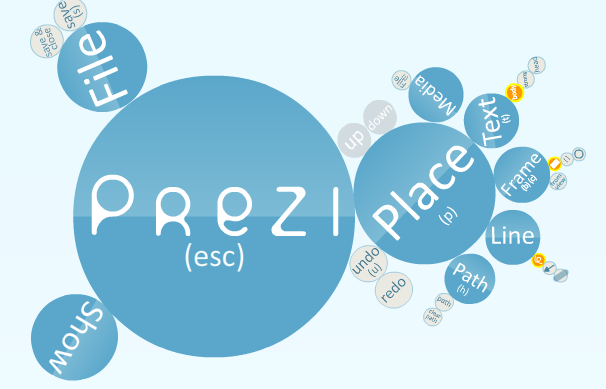 Prezi has been in private beta development for a year and now will be released to the public on 5 April 2009. Use to be called 'ZuiPrezi' - 'Zui' as in zooming using interface & 'Prezi' as in the Hungarian dininutive of presentation. On 15 Dec '08 the team dropped the 'Zui' as people could not pronounce it correctly. Headquarters is Hungary, privately held business, 8 employees, founded in 2008.
why is it if I am logged in I can not see the research page link. Its there if I am not logged in. why is that so....mmmm???? I've added some info re education links on the research page. That is very strange. Send Kevin an email and see if he can solve the problem for you. Also - if you find typos or mistakes in the body of the text, go ahead and fix them. That is how a wiki works. Everyone can edit it. And make sure you put your research into the body of the homepage where ever it belongs so we keep moving this chapter forward. powerpoint seems to be the most obvious application to make comparisons. powerpoint is well known and used, it would be my choice. I will look at my research and see if I've got anything to put forward. Look in the list of web 2.0 apps and see if there are other presentation applications. I know google has one. What does Zoho Show actually do? Zoho Show allows users the ability to create and share projects through an internet connection. This is a very "user friendly" application that allows users to share presentations with others, import presentations from other presentations, and view public presentations. This application is comparable to Microsoft PowerPoint. Sliderocket makes intelligent asset management available in one application. This also helps you create fascinating presentations, store, organize, and collaborate with your colleagues and to safely share your presentations with other people online or in person.Sliderocket is an online presentation software available at different costs including free for whatever type or length you will need the application. Not sure, but what about electronic whiteboards. They are linked to the computer and are great fun to use. They have applicaitons where you can zoom in and out and draw over pictures and hand write text and then it feeds back to the computer to create a word document. Technologies known collectively as Web 2.0 have spread widely among consumers over the past five years. Social-networking Web sites, such as Facebook and MySpace, now attract more than 100 million visitors a month. As the popularity of Web 2.0 is growing, the business world needs to grow as well due to the intense consumer engagement and creativity surrounding these technologies. furnish a setting for learner achievements to attract an authentic audience. Prezi is a web 2.0 technical platform that businesses can use to build the differing types of technologies into everyday business. Prezi allows anyone who can sketch an idea on a napkin to create and perform stunning non-linear presentations with relations, zooming into details, and adjusting to the time left without the need to skip slides http://prezi.com/about/. Using Prezi in an educational context will allow educators to create and map ideas, images, videos, then show overview, zoom to details, amaze, convince, take the day! http://prezi.com/about/. That looks great! Go ahead and post it under the business/industry heading in "Educational Applications." Also, could you post some specific examples of business presentations in which prezi can be used? You could make these up, or find some online or however you prefer. Let me know if that works. Thanks! Also, I went ahead and put an example of a lesson plan. Maybe that will help you. I tried to cite the this from the website I found it on. Can you make sure this is where you found it? Please do that as soon as you can. I think we should be careful when editing or posting new things, my lesson plan has been deleted and I had to retype it. Thanks! You can always find it again. Don't retype anything. Go to Tools - then History - and look at the earlier version and copy/paste it into the newest version. That is why it is a wiki - we can go back to earlier versions. Let me know if you need help with this again. Thanks that really will help in the future. The same thing happened to me. Have we decided which 3 lesson plans we're going to use? You need 3 for each section when you're done. So 12 total. So 3 for elementary, secondary and post secondary? Yes! And 3 for business/industry. I am pulling my hair out with the formatting issues of my section - Educational Applications. I am trying to use the table Mackenzie has inserted and it is driving me up the wall as every time I copy and paste from my word document it goes crazy and then when laying out the text with bullets and enters is not working well. Very frustrating and would hate to be developing lessons on this application. hey i'm still having problems linking the referances. I keep on wiping the referances when I link them, still not sure how I'm doing that. Anyway if anyone wants to try to link them, be my guest. I could certainly use a hand. Did you watch the video on "How to Use Confluence" on making internal links? OR go look at another page where they have them linked to see how they did it. Hi Mackenzie can you please advise of the presentaiton date and what is involved for the presentation? I am part of the Aussie Crew and we have an assingment due on the 4th May and we need to refer to the presentation in that assignment, so obviously we need to present before our assignment due date. Our actual presentation here is on April 21st at 6-9pm (American time) =) and we will be presenting to differenct teachers and professors from around this area. We will be displaying our wiki page and explaining how prezi works to those walking around and interested. Does this help? Let me know. Hi Wendy/Mackenzie, with reference to the presentation date, Wendy on our study schedule it states Tuesday the 21 st April. Mackenzie how will this work? will you be phsycially presenting in a room to people who move around and observe the variety of web 2.0 applications? Wendy if this is so, how do you think we will present our Prezi toll to the USQ folk? Ummmm.. The lesson plans are almost complete. I have picked the 3 for each section, and organized the remaining lessons. I still am creating the last 2 for business/industry. However, I am unsure of how to create a table. I know Mackenzie and Jon said they would help me, but if anybody else isn't busy and understand how, then please help! The lesson plans that need to be placed into tables are the first three that appear in each section, are separated by blue lines, and have details such as Target Audience, Standards, etc. Also, not everybody gave references for their lesson plans, so im not sure if thats a penalty against our page or not? Thanks! Hey i'm almost done with the brochure, I e-mailed Cindy and am making a few changes, so look for an e-mail soon that I will attach the brochure in. Also do I need to do an intro for the lesson plans, I know we talked about it at the first meeting but I didnt know if we still needed me too. The poster is almost done in a bit, I'll email it to everyone so you guys can give me suggestions, I have some issues, so if you guys could help me out that would be amazing. (I'll explain it through e-mail). Thanks! I am the project manager for group 13. We have attached our peer review to your page. We hope that you find it useful. Great work so far on your wiki page! Hello to the Prezi group, I am trying to add a picture to our presentation as Mackenzie had requested, but can not seem to complete the task. Can anyone assist? I edited my part on the lesson plan for the plant cyle! I put my letter from prezi in quotes too, so that should be taken care of. looking good, great work everyone. Does anyone need help? if so email me. International application edited, I would of liked to have added some pictures, but just could not work out how to do that. Thanks everyone for your hard work. Prezi looks great. This section needs to describe how Prezi can be used in international settings. Right now it only gives a history of Prezi. Someone needs to put a lot more effort into this section. I was quite familiar with Prezi before, and I have not had a chance to analyze it until today. Generally, I use Microsoft PowerPoint to create my presentations. When I saw the Prezi in wiki repository, I decided to learn how I can use it. The Prezi is a website that allows you to create presentations online. Even if you do not have an internet connection during your presentations, Prezi allows offline viewing and presenting to you. On the other hand, if you are master in using PowerPoint, using the Prezi might be difficult for you. It is completely different than PowerPoint. However, even if understanding the web-site may take a while, it is easy to use. In the Prezi design, creators can insert text, pictures, videos, movies as well as PowerPoint. Then, the interesting part begins in the Prezi presentations. Instead of slide by slide transition, slides move from one area of space to another in the order which the creator choose. As an educator, after I saw the Prezi presentation, I thought that using it might be beneficial in teaching some concepts in mathematics lessons. Since student might be pay attention to presentation if it can be created productively, effectively, and impressively. It might be interesting to watch the Prezi presentation as a viewer. I am planning to use it in my future teaching years. The Prezi Presentations inspire me deeply, and I feel more creative in using it. In addition, the creators gave some lesson plans to teach the Prezi in the elementary, secondary, and post-secondary schools. A person can use these lesson plans as a template to create his or her lesson plans. Personally, I am planning to use them. The creators give us a chance to publish our presentation on the web. Here is the most popular Prezi Presentation http://prezi.com/explore/, watching some of them were really impressive for me. In addition, if we do not want to share our presentation with other people, they set up privacy settings to keep our presentations as a private. If we have a problem or make a comment about using the Prezi, we can contact with the creators, they might be willing to help us. By the way, if you are present a lot in conferences, schools, companies, etc. I strongly recommend the Prezi. It can be effective way to impress audiences in your presentations. Prezi is so "out of the box" that it was intimidating at first, but once I started experiementing with it, it became second nature as to what to do next. I love the ability to move from creating linear presentations to movie type presentations. Prezi allows for a completely different mind set for group presentations. Because Prezi is not stored on an individual computer it allows group members the ability to access and edit on-going group presentations with ease. There are also no issues with a group not being able to present because one member forgot to bring the thumb drive.